The classical signs of acute inflammation are pain, heat, redness, swelling, and loss of function. Inflammation is a generic response, and therefore it is considered as a mechanism of innate immunity, as compared to adaptive immunity, which is specific for each pathogen. 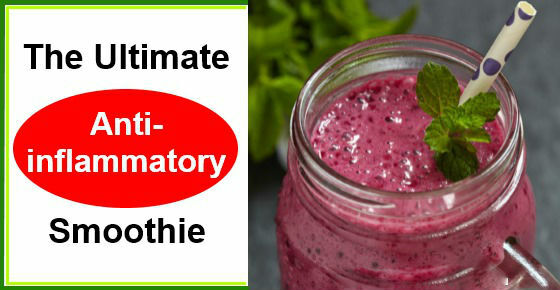 Do not worry anymore about the inflammation because now you will find out about the ultimate anti – inflammatory smoothie. Berries are claimed to have anti – inflammatory activity in humans because of the polyphenol compounds they contain. The anthocyanin is the most notable polyphenol in berries that is responsible for their distinctive colors of red, blue, and purple. They also have antioxidant properties. Low magnesium level has been associated with numerous pathological conditions characterized as having a chronic inflammatory stress component. The dark leafy greens are the best food sources containing magnesium (like kale and spinach). The Vitamin E is the one who has the anti – inflammatory properties.